Last week, the Mongolian government announced a USD 5.5 billion bailout agreement with the International Monetary Fund (IMF) and partners the World Bank, the Asian Development Bank, and the governments of Japan and South Korea. The Mongolian government has also signed an extension of its central bank swap agreement—essentially a line of credit—with China’s central bank. NRGI has released a macro-fiscal model of Mongolia’s economy that should help answer these questions. The model, a year in the making, links specific mineral projects to macroeconomic indicators such as GDP growth, budget surpluses and debt levels. As a next step NRGI analysts and consultancy Gerege Partners are preparing a full analysis of the IMF program to better understand its implications. As a result of swelling deficits since 2007, debt levels are approaching Mongolia’s debt sustainability limits, as demonstrated by the government’s astronomical interest rates on foreign borrowing and our macro model. Interest payments on public debt alone were greater than MNT 1 trillion (more than USD 400 million) in 2016; that’s more than the government spent on healthcare for the whole country. Results from the baseline scenario of the model confirm that the current trajectory of Mongolia’s public finances is unsustainable in the absence of radical measures—stopgap interventions by the IMF and Mongolia’s other partners notwithstanding. Assuming that the current short-term liquidity pressures are resolved (i.e., rolled over, maturities lengthened), that the external environment remains accommodating and domestic growth picks up rapidly, and no major changes in government policy, our model projects debt spiraling upward as of 2025. Without a significant cut in debt through debt restructuring and permanent budget adjustment measures—not just a shrinking of the deficit or short-term bailout of the kind offered by the IMF program—Mongolia will find it hard to return to a sustainable debt path and prosper. Results from our model show that, while the Oyu Tolgoi copper mine and Tavan Tolgoi coal mine (along with other mines) will generate just enough additional revenues between 2019 and 2024 to stabilize the deficit at its current very high levels, deficits will widen rapidly again thereafter. 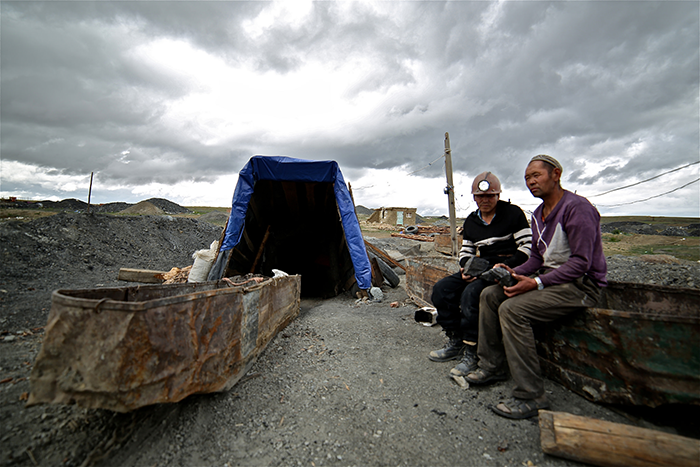 New mineral projects will not solve Mongolia’s debt sustainability challenge. Attracting new mineral investments remains difficult globally. And even if new mining deals are rushed through, it will be decades before major revenues materialize, if ever, as we’ve seen with the existing mega-mines in Mongolia. It is highly unlikely that new production will save Mongolia from exploding debt levels over the medium term. We will release projections of the IMF program’s impact on the Mongolian economy shortly. However an initial assessment of the fiscal measures proposed suggests a focus on revenue generation and hard-to-enforce governance reforms rather than a needed reprioritization of spending. These choices have led to tough decisions for government officials. We are concerned that the government and its international backers repeating a critical mistake: assuming that future mineral revenue growth will save the country. Unrealistic mineral revenue expectations got Mongolia into trouble; such expectations will keep Mongolia there. The IMF program may be delaying the pain by a few years, which could prove a valuable opportunity to rethink the country’s growth strategy. Or, it could be just another episode in a continuous cycle of booms and busts. Our aim is that our new model can help the government and citizens alike chart a course for a meaningful exit from unsustainable debt. Andrew Bauer is a senior economic analyst with the Natural Resource Governance Institute (NRGI). David Mihalyi is an economic analyst with NRGI. Dorjdari Namkhaijantsan is NRGI’s Mongolia manager. 24 min 14 sec ago.